Feel great and get fit with the SF-E3609 Magnetic Elliptical Trainer. This high quality easy to use elliptical will fit virtually anywhere in your home. 8 levels of adjustable magnetic resistance will allow for precise adjustments to increase/ decrease workout intensity. Receive a full body workout that targets arms, waist, hips, and legs. Use while watching television or listening to your favorite music. The integrated tablet holder allows you to watch your favorite movie on your tablet or smart phone. 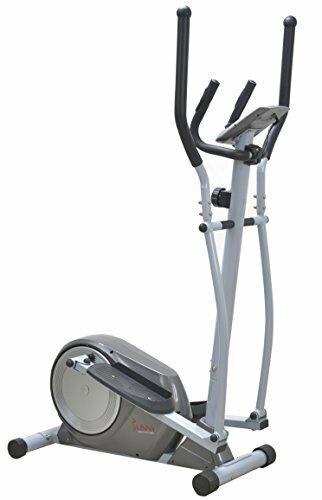 The elliptical is equipped with large anti slip foot pads for safety and confidence while using. Digital monitor displays time, speed, distance, calories, and heart rate. Hand pulse sensors read your current heart rate to determine the level of intensity. Built in transportation wheels for easy portability. Feel great first! and then everything else will follow.